Servicesat's LOW-COST on-demand SNG services and mobile antennas, are an amalgamation of three state of the art products, that we have now brought together, to provide the equipment and service for an SNG product that is amongst the lowest priced of its kind in the market today. The award winning Direcstar auto-deploy antenna is a one-touch self-aligning auto-deploy antenna, that (once installed) requires no technical training to operate and is deployed and locked on to the satellite in two to three minutes. 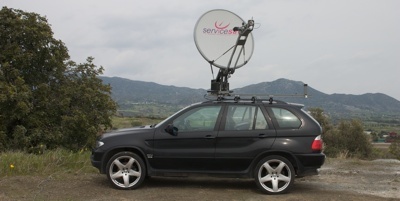 In conjunction with the Direcstar auto-deploy antenna, Servicesat teamed up with multiple manufacturers of MPEG and H.264 encoders, as well as DVB encoders and IP modems. In order to provide trouble free live-streaming, anywhere you need. Occasional Use allows access to Servicesat's capacities for just a few hours - to transmit Sport events, TV reports, or any other kind of video streams from anywhere within the footprint used, to your studio. Each transmission should have a minimum of 15 minutes. Occasional Use slots must be booked via the online booking system. Service subject to Castor Broadcasting standard Terms and Conditions for Occasional Use services which are available on request. Prices are subject to change without notice and are exclusive of VAT. Service will be invoiced in EURO.